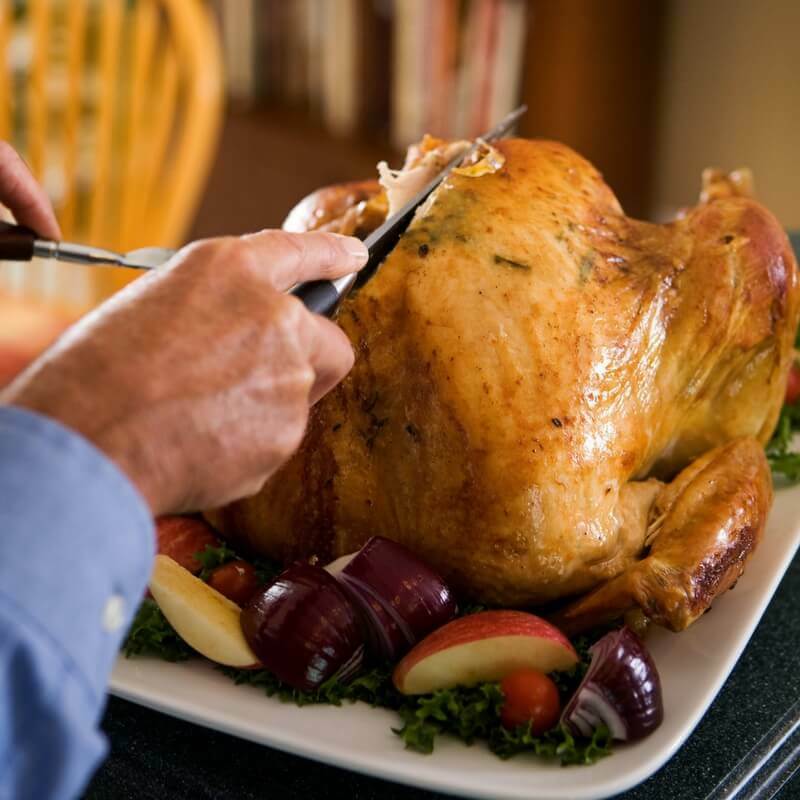 It’s the holidays and no one will judge if you cut a few (delicious) corners with these clever holiday meal hacks guaranteed to reduce stress while keeping your guests (and yourself) happy. The holidays are amongst us! 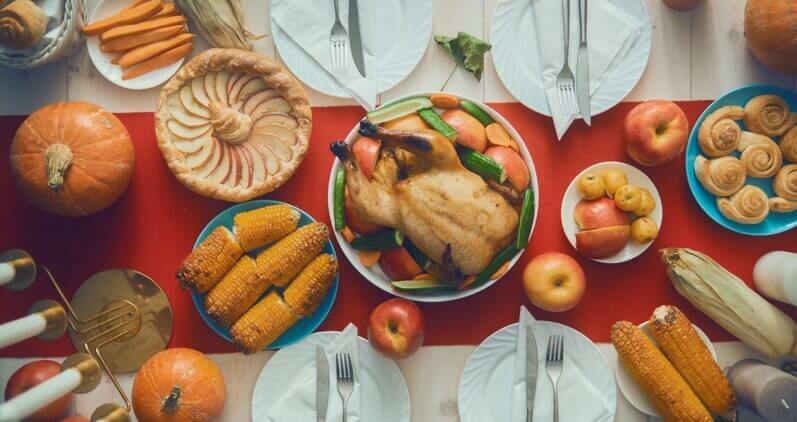 If you have been a guest at a holiday dinner, you know there is nothing easier than showing up with a store bought pie, relaxing and piling up your plate. But if you are usually the one who hosts, you also know just how stressful it can be, especially with a house full of guests. 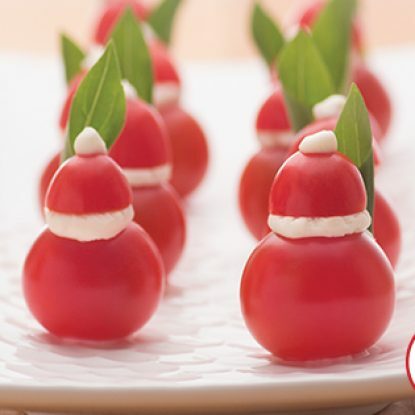 If you are a busy mom or simply looking for some time saving tips this holiday season, check out these clever ideas on dressing up store bought food to cut corners. Let’s make the holidays a little easier (and cheaper) so that you can enjoy what really counts–celebrating with loved ones, making new memories, and eating delicious food! 1. Want to kick back, relax, and pile up your plate without a lot of the messy work? Call your local barbecue joint and preorder a smoked or fried turkey. Take the guess work out of this one! 2. Tired of labor intensive mashed potatoes that your guests never eat? Consider adding truffle oil, chopped bacon or pancetta, fresh herbs, sautéed mushrooms, sharp cheese or mascarpone to premade refrigerated mashed potatoes. 3. Don’t have time to bake a pie from scratch? Decoratively garnish store bought pumpkin pie with whipped cream, nuts, cinnamon and nutmeg. 4. 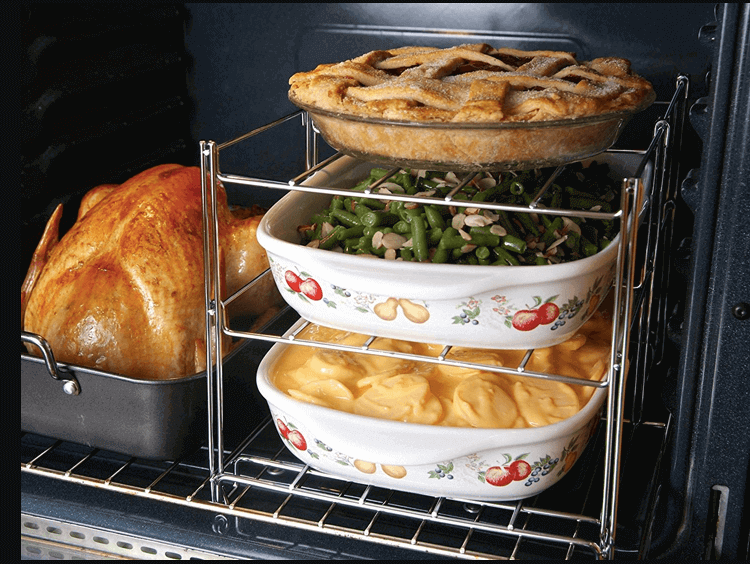 If you have a small oven or know you’ll need several items to bake at the same time, consider purchasing a 3-tiered baking rack to increase oven space. 5. Store bought stuffing might seem plain but mix in a combination of dried fruit, toasted nuts, sautéed mushrooms, onion and garlic, or sausage and fresh herbs to bring it to the next level. 6. Adventure calling and you want to tackle a homemade pie dough? Don’t overwork yourself cutting the butter into the flour. Instead, use a regular cheese grater to grate frozen butter into the flour. 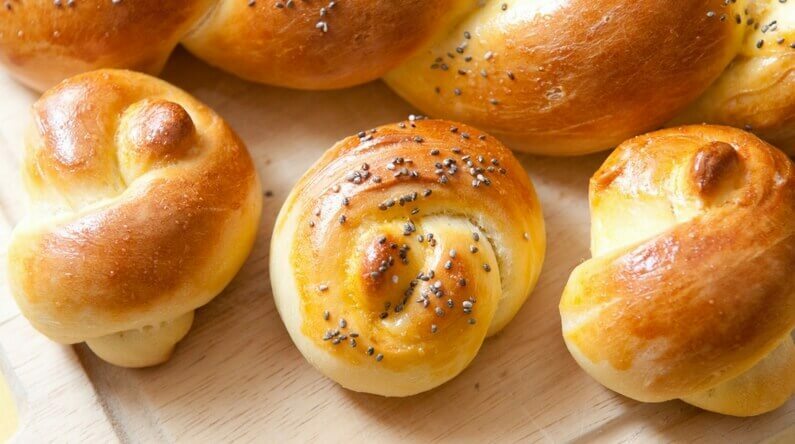 7.Dress up store bought rolls by brushing warm rolls with melted butter, a sprinkle of sea salt and fresh herbs before serving. 8. Can’t let your favorite stuffing recipe go? Try baking it into individual servings in a classic muffin tin for a preportioned twist on the classic recipe. 9. Keeping recipes organized (and splatter free) can be a real challenge. Tape your recipes up to the cabinets in front of your workspace for easy access. This is also a great way to delegate tasks if you have cooking helpers since the recipe is already posted for them. 10. Whether you’re visiting friends and family this year or hosting the gathering, you’ll likely need some appetizers for snacking. 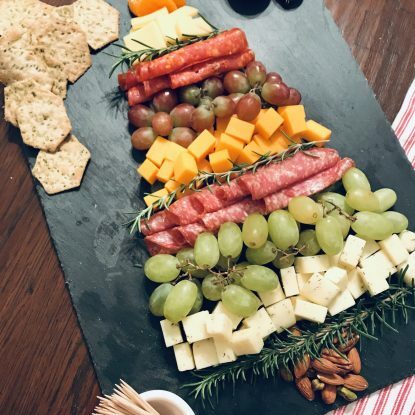 Save a step and appetizers such as cheese and fruit plates, crudités, cheese balls or dip and decoratively rearrange on a festive serving platter. 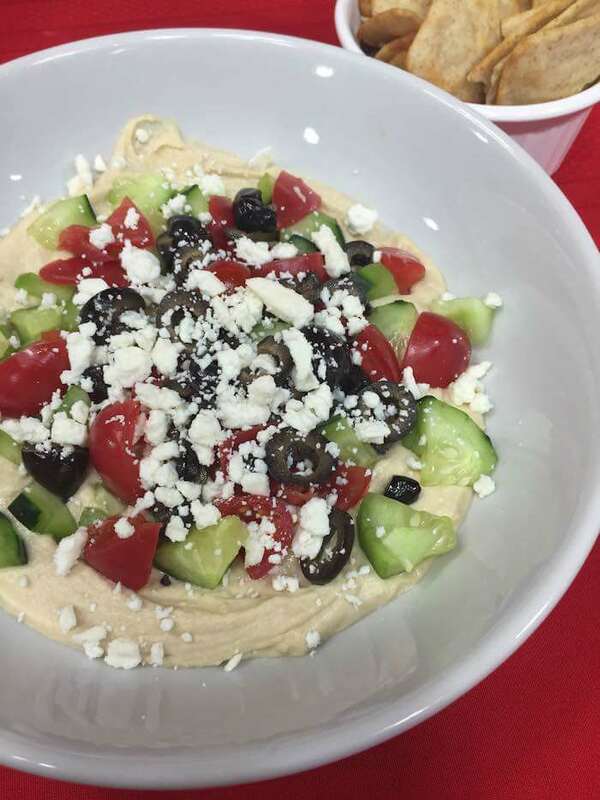 I love purchasing premade hummus and making a quick dip like this Mediterranean Layered Hummus Dip. 11. Time to dust the cobwebs off those slow cookers! Clear up stove space by heating (and even cooking) some of your holiday recipes in a slow cooker. 12. Save yourself hours of hassle before the kids go crazy with excitement and the in-laws start showing up by measuring and chopping vegetables such as carrots, mushrooms, garlic, and onions ahead of time. Label and store in gallon size zip lock bags. Shh…we won’t tell! 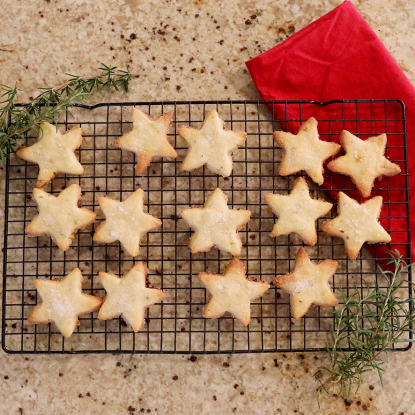 What are your favorite holiday shortcuts?